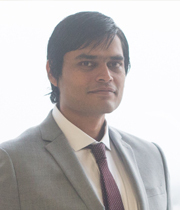 Shilpak completed his PhD in Mathematics from the Pennsylvania State University in 2017. Thereafter he has worked as a post-doctoral research fellow in data science at the Albert Einstein College of Medicine before joining IIITD. His interest in Mathematics is mainly in dynamical systems and ergodic theory. In particular he has focused in the application of combinatorial techniques to build examples of dynamical systems satisfying interesting dynamical properties. He is also interested in machine learning and data science and has worked on their application to the healthcare care industry.